Analytics and advertising: What makes Lijit the legit choice? The story of Lijit is a bit of a twisty one. 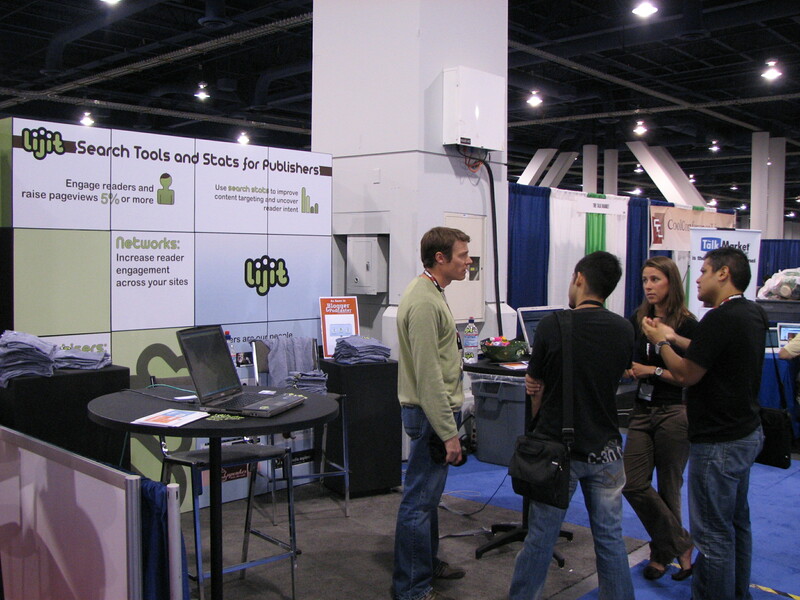 The company, which I was first introduced to at Blogworld Expo 2010, started off its venture as a service that would help site owners to provide better search for their content. As happens so often in technology, time moved on and the folks at Lijit realized that the information that they were gathering was better suited for other uses. Don’t call it a pivot, rather it was simply a maximization of resources. I had the chance to sit and talk with Lijit when I was out in Boulder for Startup Week a couple of months ago. Stepping inside the offices, it’s immediately clear that data is king at this company. Oversized screens show hordes of it and there’s a soft buzz of voices floating through the space. It is designed to have the look of a park in the spring. Large patio umbrellas grace the office and it’s not unlike most of the startup loftss that you’ve seen in the past. Heck, there’s even a Rock Band game. But there’s something else about Lijit that strikes a chord. There are equal parts laid-back mantras and urgency that combine to set the company apart. I sat down and talked to Lijit’s CEO, Todd Vernon. He had some great insight as to why Lijit was thriving in Boulder, what publishers have been missing and more. We first talked about the company’s roots. I brought up the fact of meeting Lijit when it was just doing search. Vernon told me that search is still important, as part of Lijit’s roots, but that “analytics and advertising services are the present feature” of the company. Facing facts, almost everyone who has a site online that hopes to make money from it will do so by running advertising of some form. Unfortunately, for smaller sites, it’s often times difficult to get the right kind of advertising, so many site owners feature Google AdSense or some other type of keyword-targeted ad service. Typically speaking, these don’t pay out well enough for people and the lay person might have a difficult time understanding how to implement them effectively. This is what Lijit is trying to fix. Vernon rightly states that “most sites don’t have the ability to have ad people. It’s very difficult to be one of these publishers” because it’s time that you are having to spend dealing with a product with which you might not be very familiar. Lijit approaches advertising networks with loads of data from its network of sites (referred to as publishers and numbering over 20,000 at the time of this interview). That gives Lijit bargaining power so that it can provide the most effective, highest CPM ads back to its publishers, while making sure that the ad networks are getting the right kinds of traffic. Interestingly, even with numbers that big, Vernon can name off specific example sites in a snap. This “corner store” closeness is something that has set Lijit apart in the space. That analytics side mention brings us back to the beginning. Lijit realized that, while search was great, there was more work to be done in site analytics and advertising. While Lijit services sites with as few as 1 visitor per month, the company does so with the same enthusiasm that it hands to its bigger publishers such as the Cheezburger Network or WebEcoist. But there are difficulties to overcome. “People look at us as a point solution for search, but we can offer more than that.” Getting that word out, however, is key to Lijit’s continued success. Lijit also faces the fact that everyone else in Boulder does — The company is not in the valley. But it also doesn’t plan to be. Yet what Lijit is doing is very real, to the point of near-palpable. The company closed a $10 million round of funding this past April and has just passed the 100 million mark of daily ad transactions for its publisher network. Apparently, things are going well.